With the Double Top / Bottom Signal Service you will receive the high probability signals without the need to run a computer 24 hours on 5 days per week! The double top / bottom signals will be send in real-time and with screenshots to your telegram client on your your smart phone and/or computer. In contrast to the Double Top/Bottom Alerter which needs to run on a relatively fast computer or your virtual private server to receive signals to your smartphone, with the Double Top/Bottom Signal Service this is not necessary. All you need is a smartphone with the telegram messenger installed. Then you will receive the signals in real-time. The advantage of the signal service is clear: You save the monthly costs for renting a server and the costs of buying a fast computer! How Does A Signal Look Like? 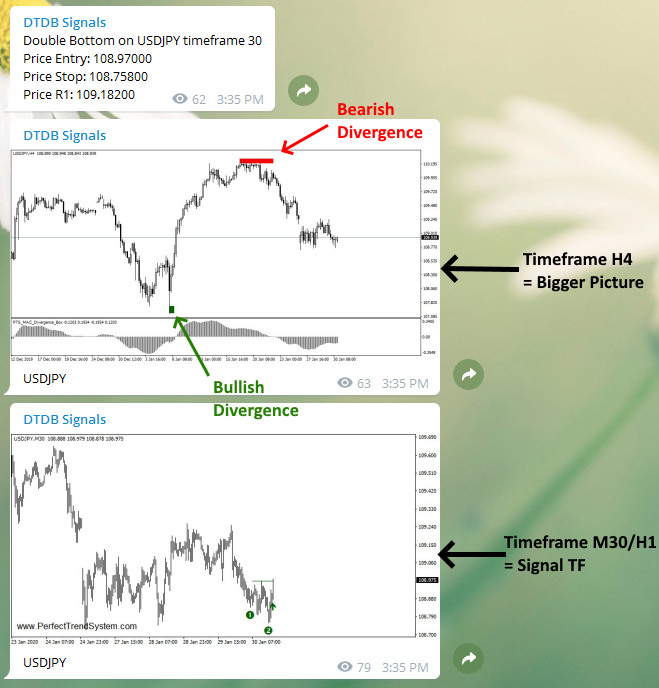 Another big advantage of the signal service is that each signal comes with a screenshot of the bigger picture (h4 time frame) and a screenshot of the time frame which generated the signal (M30 or H1). With these screenshots you can directly decide if a signal is good or bad. The following screenshot shows the 3-messages sequence which you will get with every signal in real-time! Into this telegram channel you will receive all signals from the 33 trading instruments. There is no filter applied. You need to decide for or against trading the signal according the 3 preferred trading setups. The signal service can be used for a fair price of only 7 Euro per month. A normal virtual private server (VPS) costs between 20€ and 40€ per month. Therefore, this signal service can be a low cost alternative to running the Double Top/Bottom Alerter on your own VPS. 7 Days Money Back Guarantee! No questions asked. I will directly refund your money if you request within 7 days after your purchase. Exceptions: If I already answered questions about the signals/indicator or system then I invested my personal time and then I can't give you a refund or if you downloaded the free version of the indicator PTS_DoubleTopBottom before the purchase then you know exactly what signals you get beforehand.